Bem-vindo! 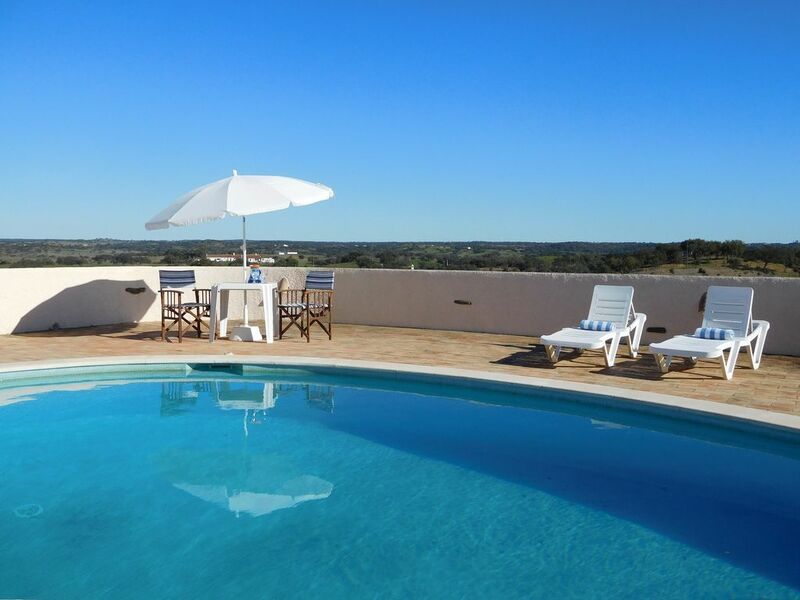 Just an hour’s drive from Faro airport, Monte do Vale da Nora de Cima is a 3 bedroom restored traditional farmhouse perched at the top of its own hill, set in 11 acres of grazing land, with olive and oak trees, offering stunning views of the gently rolling hills of the Alentejo countryside. The high vaulted ceilings of local timber and reed give a spacious feel throughout the house as well as providing a cooling effect in summer. The master (or mistress!) bedroom is a grand room with king-sized double bed and offers air-conditioning, although rarely needed in these traditional cool houses. The second bedroom is equally spacious, also with air-conditioning, and has twin beds. The third bedroom has twin beds but can be set up as a king-size if required. The family bathroom features a walk-in shower and wet-room area as well as generous space for the basin and toilet. There is a further toilet with basin next to the bathroom, both are close to the bedrooms. The kitchen/dining room is fully equipped with space for 6 around the dining table. A great room for a family breakfast to get your day started or other meals if you choose not to dine al fresco on the patio. A built-in barbeque just outside the kitchen gives you further options. Next to the kitchen is the impressive lounge with double doors on to the patio. The lounge features a mezzanine level as a quiet escape or den and this overlooks the luxurious lounge suite below with seating for 6. The outside space features the summerhouse and pool surrounded by lots of room for the sun loungers, dining area and quiet shady spots. The main attraction is the view! From the expansive patio of this rural retreat watch the sunrise bathe the land in gold and gaze in wonder from your sunbed at the birds of prey soaring high overhead. During the hot Alentejo summers dip in and out of the cooling water of the swimming pool or play table tennis in the shade of the summerhouse. Perhaps a leisurely lunch al fresco. In spring time Alentejo is a stunningly beautiful natural environment and is great for walking, hiking or cycling (4 mountain bikes provided) on countryside tracks alongside kaleidoscopic fields of vibrant wildflowers. Watch the stalks feeding their young high up in their nests and enjoy spotting wildlife as you pass small farms with newborn lambs, kids and the regional black piglets. The farmer often grazes his sheep in the fields surrounding the villa and you may even see lambs being born. Horseriding, birdwatching, tennis, yoga and other activities are all available locally. You can even arrange a wonderful massage in the comfort of home. Just a 7 minute drive to the supermarkets, cafes and bars of Ourique. A 60 km drive along meandering roads virtually devoid of traffic will take you to the stunning, unspoilt West Coast beaches. The buzz of the Algarve is less than an hour away. Or take a train from the nearby station of Funcheira and visit historic and modern Lisbon for the day. In the evening, refreshing drink in hand whilst relaxing on the patio, watch the cluster of terracotta and white buildings in Ourique on the distant hill turn pink as the sun sets once again in all it’s glorious colours. Ourique then begins to sparkle as the lights come on and as the sky darkens, it too sparkles with stars unhindered by light pollution. Perhaps a drink at the friendly bar just down the road mingling with the locals, followed by dinner at home under the starry canopy or dine out at one of the restaurants we can recommend. And the next day, it all begins again …. This is a real holiday! Log burning boiler for winter use only. Log burning for winter use only. One set per week. Pool towels provided. Guests are asked to bring their own beach towels. There is dining in the kitchen or outside on the patio. A small selection of games are available. A small collection of DVDs provided. Outside only. Guests must use ashtrays provided. Minimum depth is 1.2m. Maximum depth is 2m. Children under the age of 11 and non-swimmers must be supervised at all times in the pool area.